Drama/Gainful, Italy, 1962, 124 min. Synopsis The film shows the history of the Neapolitan popular revolt against the invading Germans, during the second world war. 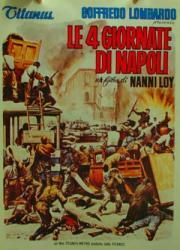 During the four days in Naples the revolt turns over in just few hours. Neapolitans slinged on rifles and guns, and they armed themselves with stones, house-objects, gasoline-bottles and everything, anonymous and silent. Gennarino Capuozzo, a ten year old child killed on a barricade while he was fighting against the invasors, is remembered by people as a hero.